The game was played at a high pace early, but with plenty of whistles through the early minutes resulted in not much in the way of chances, with neither team able to either create anything or force a mistake. The Bulldogs soon afterwards started to dominate the play, with the line of Keaton Mastrodonato, Ryan Miotto and Jackson Doucet hemming the Kings in their zone for over a minute, testing Mitch Adamyk several times but being unable to find the net. They continued to push, drawing a penalty on the next shift. They did everything but score on the power play, spending as close to a full two minutes in the zone on the attack as possible, but again just couldn't get a bounce with a handful of pucks on net. The action would slow throughout the remainder of the period, until the Kings got a late power play opportunity that the Bulldogs defended well to the buzzer to keep it scoreless after 20 minutes. Shots were 15-8 Bulldogs, but it felt like considerably more. The second period was vastly different through the opening five minutes, as the Dogs spent the better part of it trying to gain the attacking zone. While they didn't give up anything to the Kings, they didn't generate anything either. 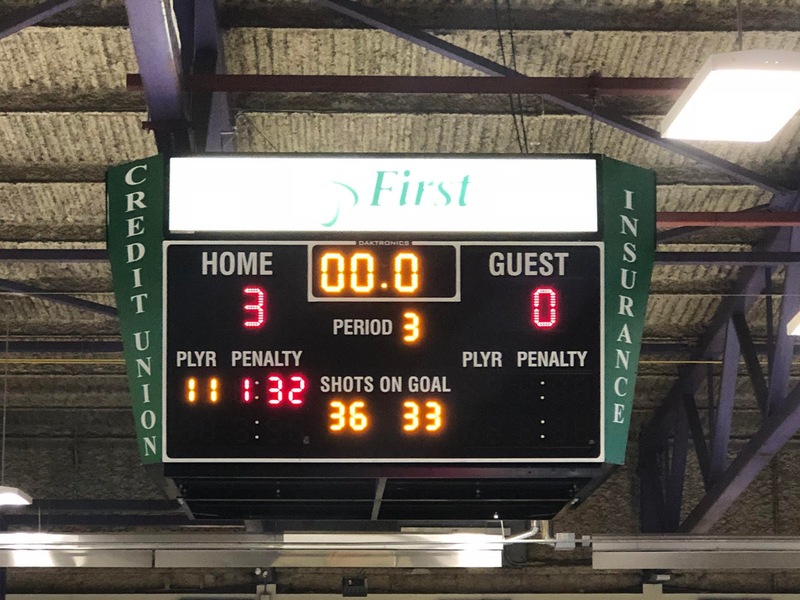 Another Powell River power play was killed off, but the Dogs still couldn't get their game going. The Kings would open the scoring eight minutes into the period on a play that was hard to accept, as Ryan Miotto took a half blindside/all head shot hit at the Bulldog blue line while accepting a pass that resulted in him being down and hurt on the ice. No call came on the play, and seconds later it was a 1-0 game as the Kings capitalized with a Bulldog player down and out of the play to score on an odd-man rush as Mitchell Williams roofed a cross-ice pass over the glove of Hawthorne to open the scoring, with assist going to Ethan Martini and Kyle Kawamura at 8:37 of the second. 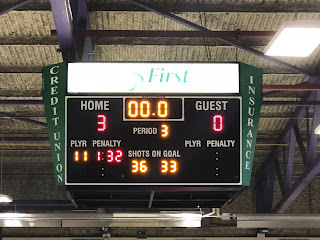 There would be no scoring the rest of the period, with the Bulldogs coming up with a couple solid penalty kills to keep it that way, with Hawthorne making a notable save on Josh Coblenz who walked in tight. The Bulldogs had a fantastic chance late in the frame on a breakaway for Ty Pochipinski on a pretty Mackenzie Wight set up, but despite being hooked off the puck under the arms at the top of the crease the Dogs couldn't earn a penalty call. Shots in the period were 19-8 Kings, for a 40 minute total in their favour of 27-23. The Bulldogs had a renewed urgency to their game to start the third, and did a better job of getting pucks on net and spending time in the attacking zone, but couldn't through the first half of it find the net. A long 2 on 1 early in the period saw perhaps one pass too many result in not a shot on net. The Bulldogs earned a power play with ten minutes to play, but couldn't cash in on it. They would pay for it, as the Kings went up 2-0 just two minutes later as Ryan Brushett walked across the crease from below the goal line up the right side where he tucked a backhand home around the outstretched right toe of Hawthorne. Levi Glasman drew the only assist on the play at 12:38 of the third. The Kings would put the game away two minutes later, on a delayed penalty situation that saw the Bulldogs touch the puck twice, but the Officials didn't deem it long enough for possession as play continued. Hawthorne would make the first, and perhaps second save but a scramble continued that resulted in the puck ending up in the back of the net courtesy of Ethan Schmunk, with assists going to Matt Rickard and Josh Coblenz at 14:10 of the third to complete the scoring. Third period shots were 10-9 Bulldogs, for a game total of 36-33 Kings with Mitch Adamyk earning 1st star honours with the win and shut out, while John Hawthorne took the loss. Both teams went 0 for 4 on the power play. . The Bulldogs are next in action Friday for their only game of the weekend, as they host the Victoria Grizzlies.